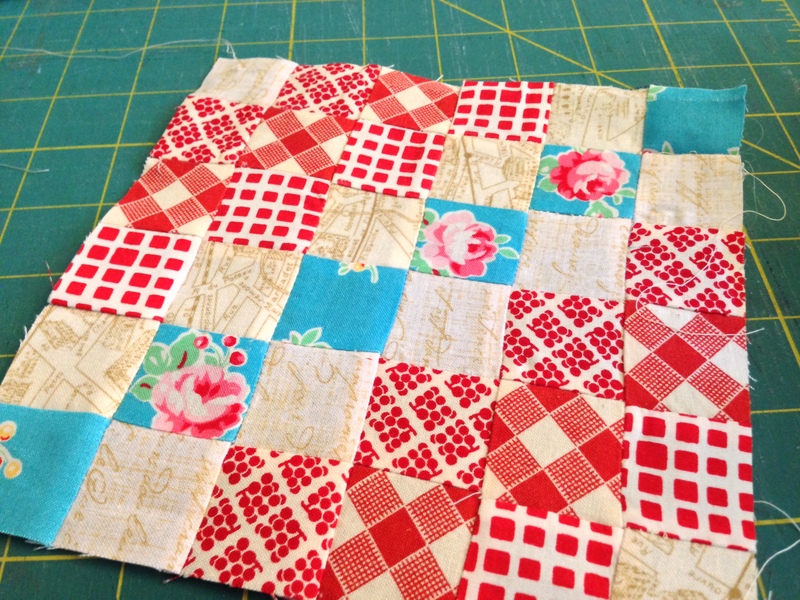 It seems the swoon block is sort of a celebrity in the quilting world. And I think I understand why. The first time I saw it, well, I guess you could say I swooned. You could definitely say that the one thought pounding in my head over and over again was “MUST.HAVE.NOW”. I purchased a .pdf copy of the mini swoon pattern. The block is hard. Well, hard for me. Each one took 3+ hours. 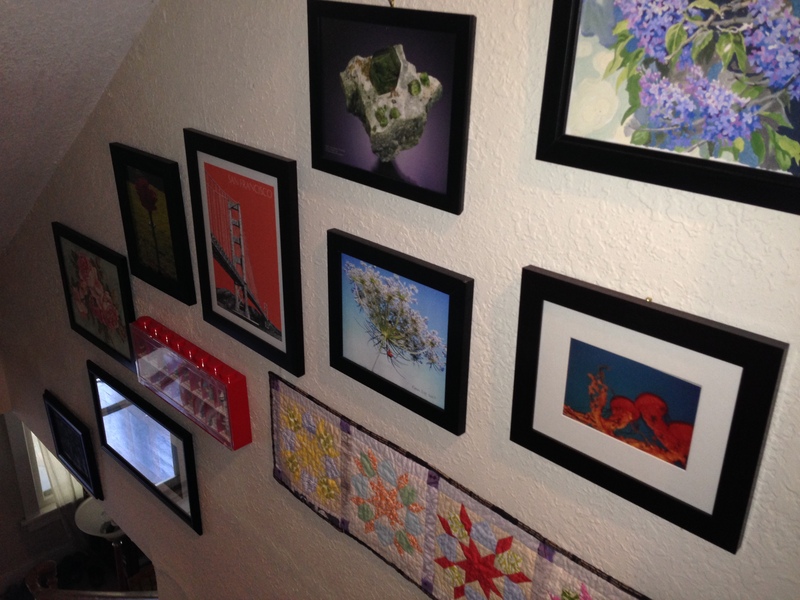 Lots of cutting, ironing, piecing. But so worth it. Even worth it where my swoons are a little wonky in pieces. This quilt has a lot of my favorite quilty things… low volume, quirky grey prints, Anna Maria Horner and Joel Dewberry fabrics. And my favoritest is this fun text binding… adds a lot of whimsy. Not very straight whimsy, but whimsy. My former personal trainer is a person I very much adore. I went to her afraid of excercise – distrustful of my body. I signed up for some group training classes and got so much more than just instruction in strength training. She was so kind, so generous, so supportive, so encouraging – so everything that is wonderful that I started to believe that I was worthy enough of taking care of myself through exercise. But M cares so much about people, about her clients, that I was convinced I can do anything. The very fit often focus on making fit people fitter – M focused on giving us the tools, strength, encouragement to love exercise – no matter what our fitness level was. My health journey still is a, well, journey. Years of bad choices based on a distrust and hatred of my body take a long time to get over. But M started me on the path to recovery. I haven’t been able to make it to sessions with her for a couple years now, but she still is in my heart. And when I accomplish something meaningful to me in my fitness practice, I think of her and how proud she would be of me. 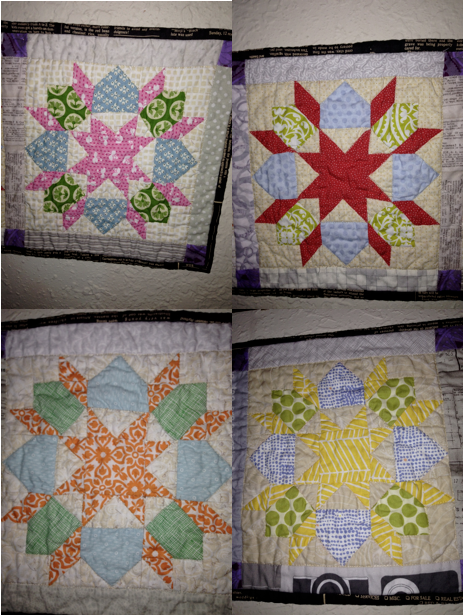 I jumped at the chance to make her a quilt out of those panels for her baby girl (yet to be born). 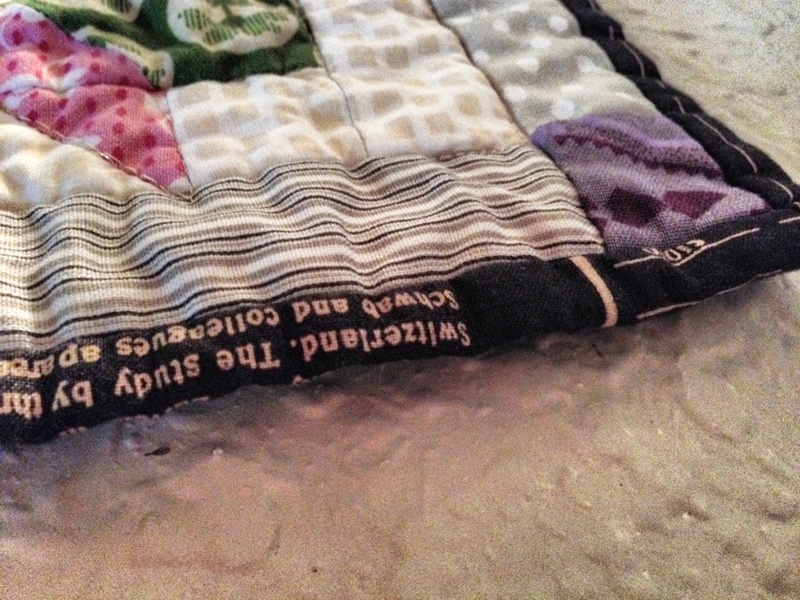 I love this quilt because it goes a small way in letting M know how much she has meant to me. And I love it because it is frickin’ adorable. 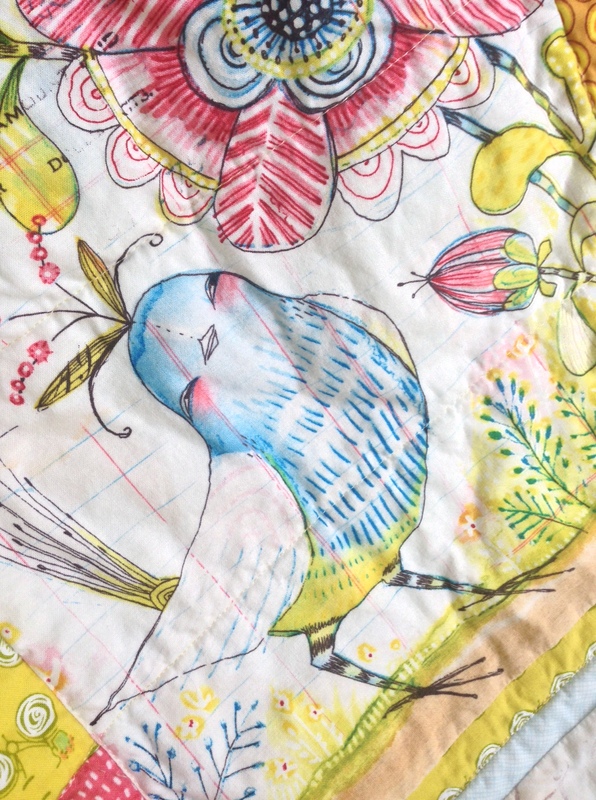 I used one of each of the panels – gifaffe, bird, lion, elephant – and then added strips of fabrics that pulled out the colors in the panels. I love love love love the light blue shade (“Lake”) in Carolyn Friedlander’s Architextures collection. It is such a pure light blue – matches when no other blues do. 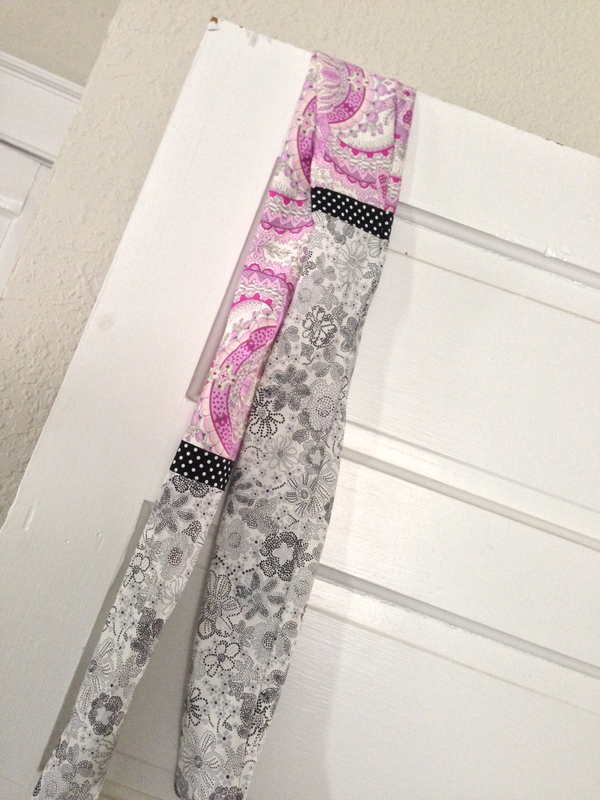 I am pretty stingy with it because I love it so much… so I used only a little bit in the binding, along with a pink fabric from the Hello, World line. 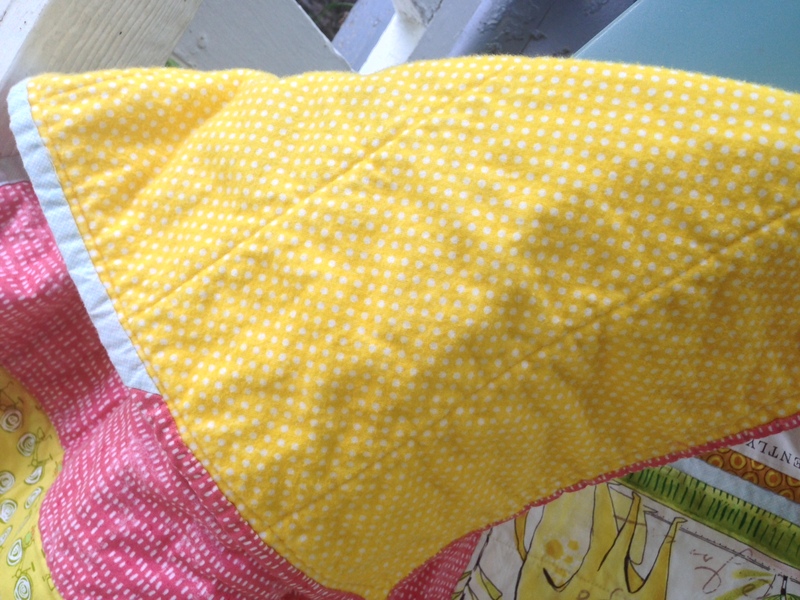 I backed with a super soft cotton flannel and did simple straight-line quilting. 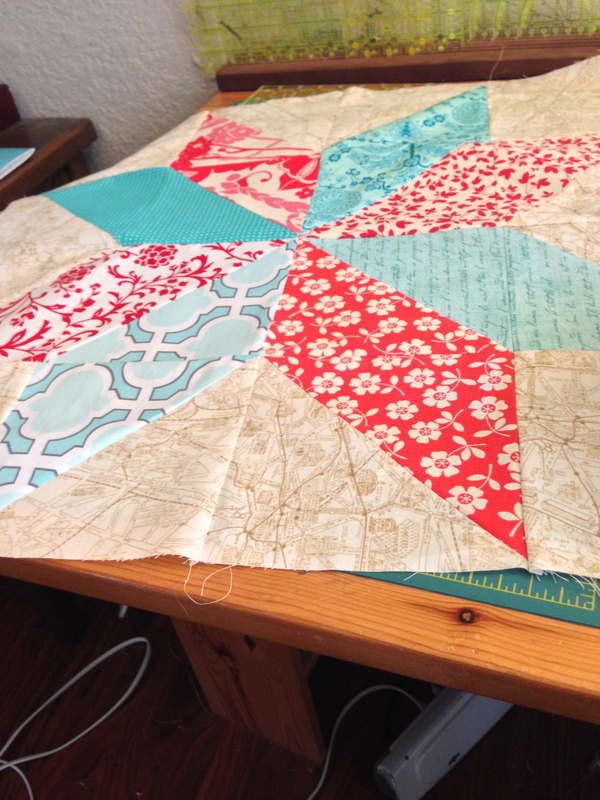 I wish I was interested in quilting more, but just not there yet. But this quilting is functional. 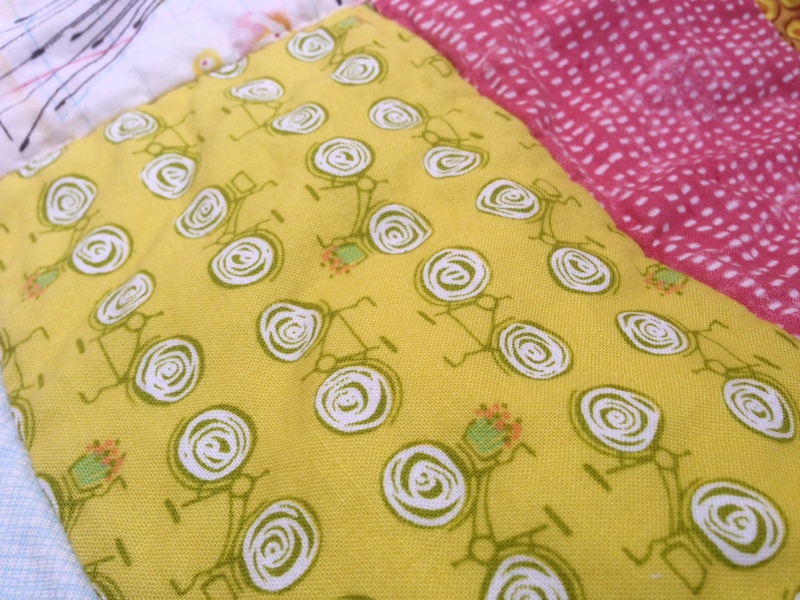 One more little thing about this quilt… I love this bicycle fabric… so sweet and a nod to M’s love of fitness. 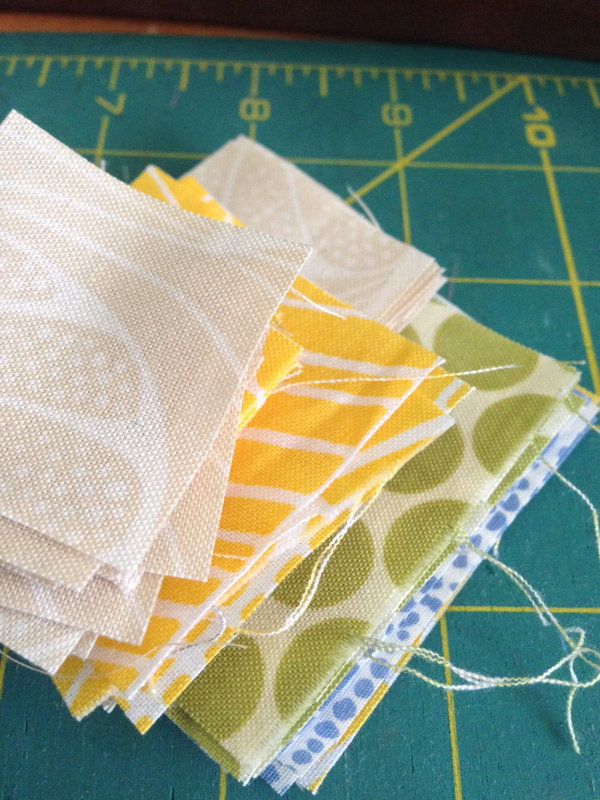 It is Go By Bike in Lime by Erin McMorris that I got as part of the Fabric Shoppes Color Your Stash bundle. 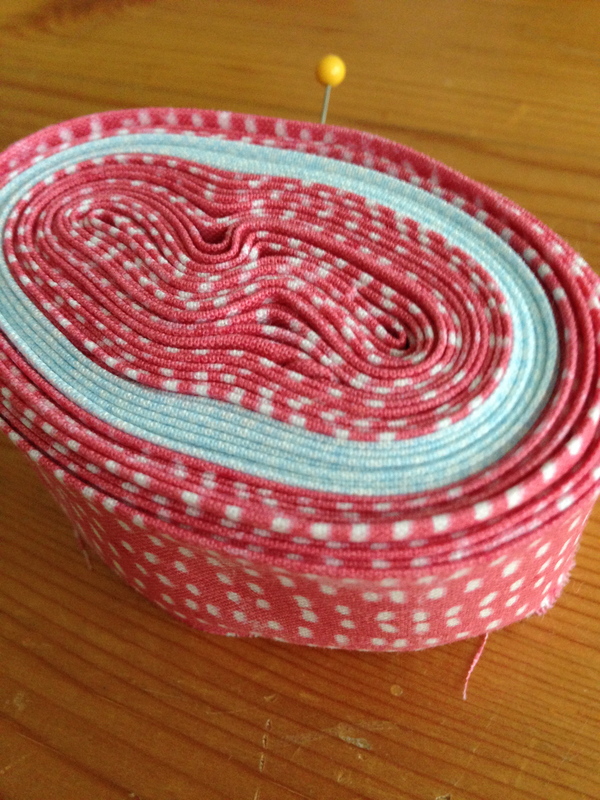 Fabric Shoppe also has yardage of this available. Linking up with Amanda Jean for Finish It Friday. I bought some cotton lawn, I got some voile from a new store in the west bottoms called Modern Makers, I pulled some black and white polka dot stash, and made myself a little scarf. Scarves are good for me, because they break the harshness of my almost-entirely-grey-and-black wardrobe. But I like them thin and long – hard to find. So in love with this idea of making my own. And that voile is so soft, hard to believe it is even cotton. I love the look of Thimbleblossoms patterns. 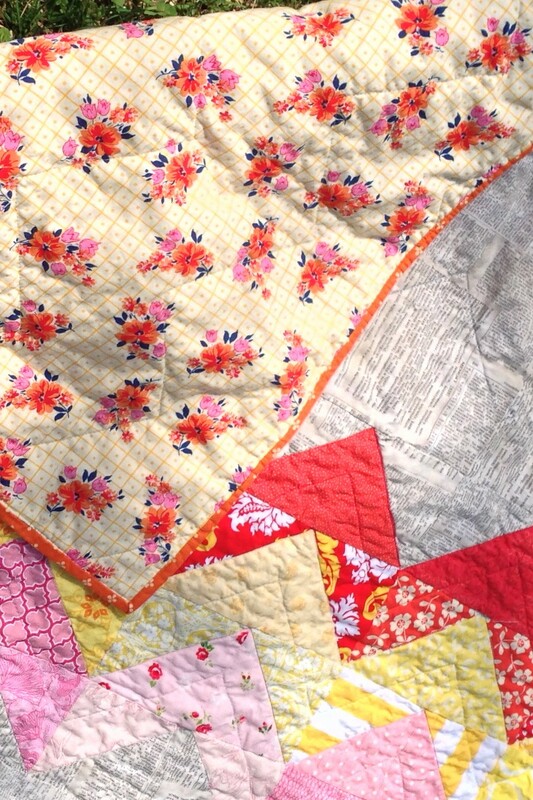 Gorgeous quilts that seem well thought out. After much back-and-forth, I took the plunge and bought the mini swoon pattern. 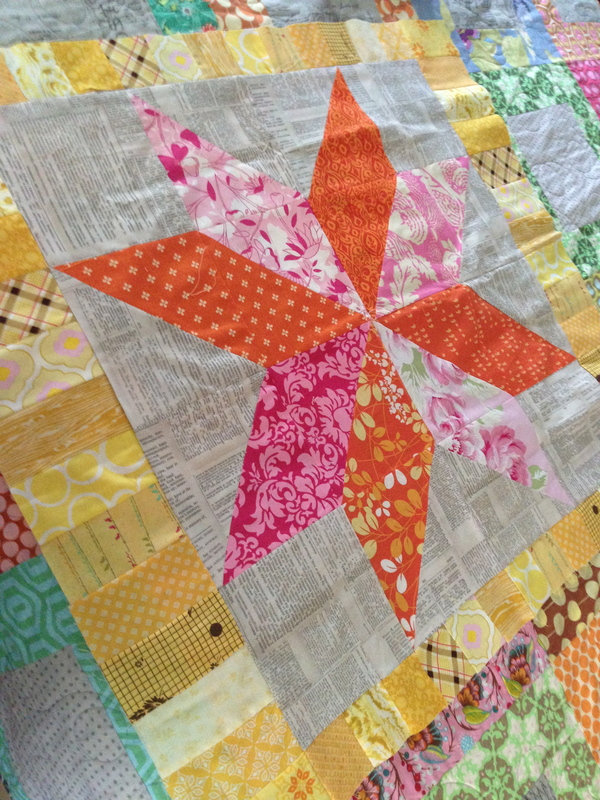 Love the swoon star – but it looks hard. Weekend after next, maybe. 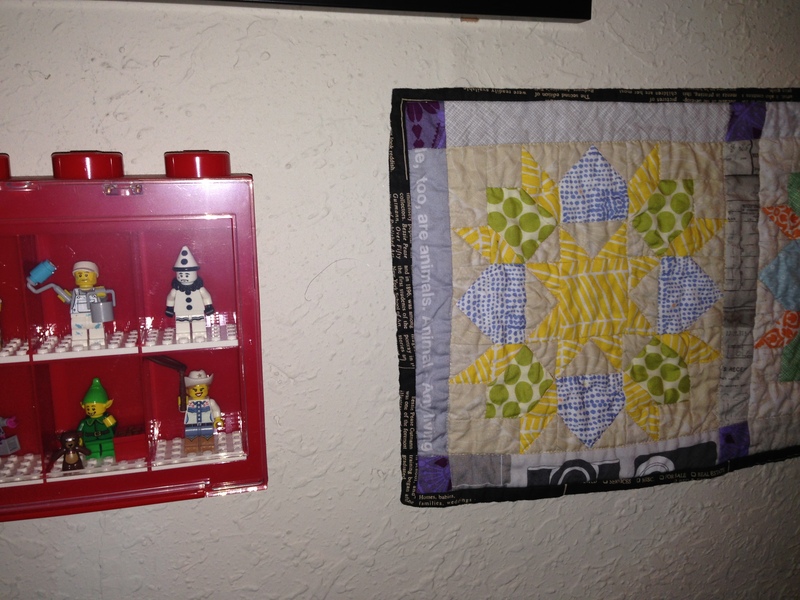 I really do want a mini swoon quilt. Really, I do! 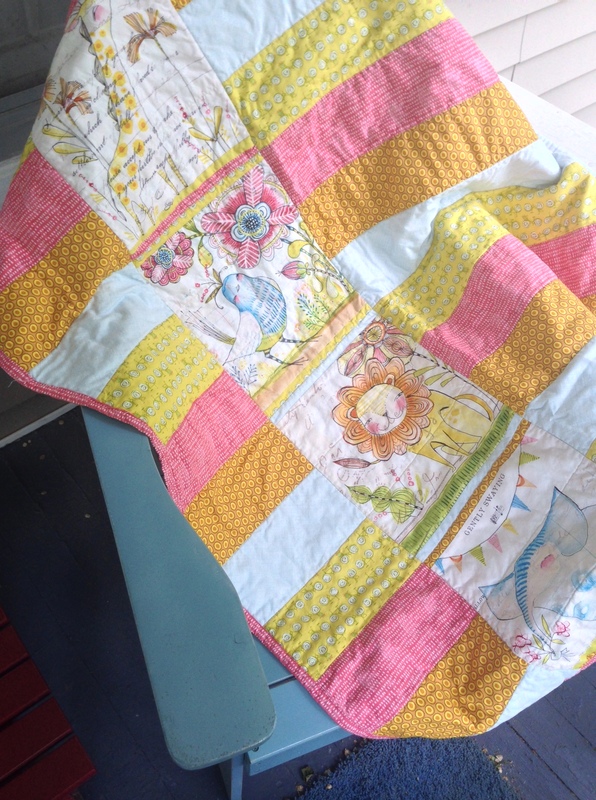 I think I have almost worked through my making-quilts-for-little-girls phase. 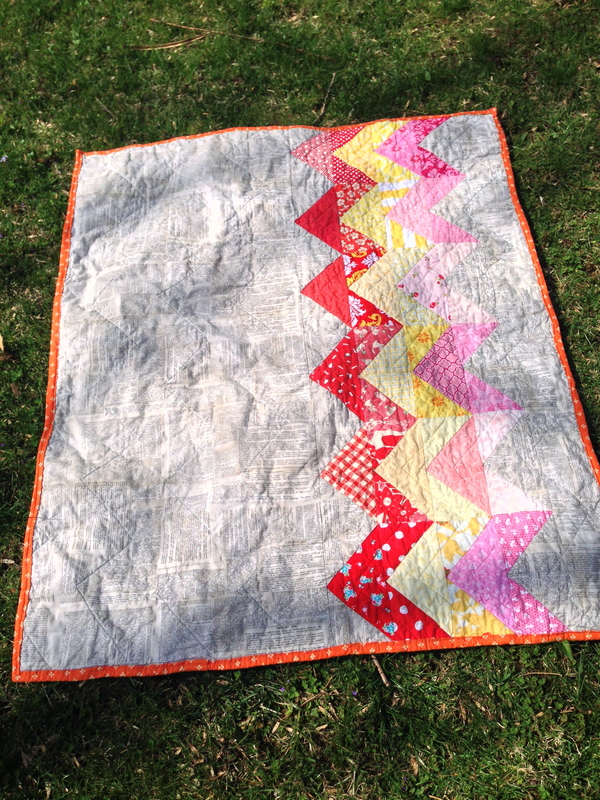 First there were was this one… I wanted to make bright chevrons on a mostly neutral quilt. 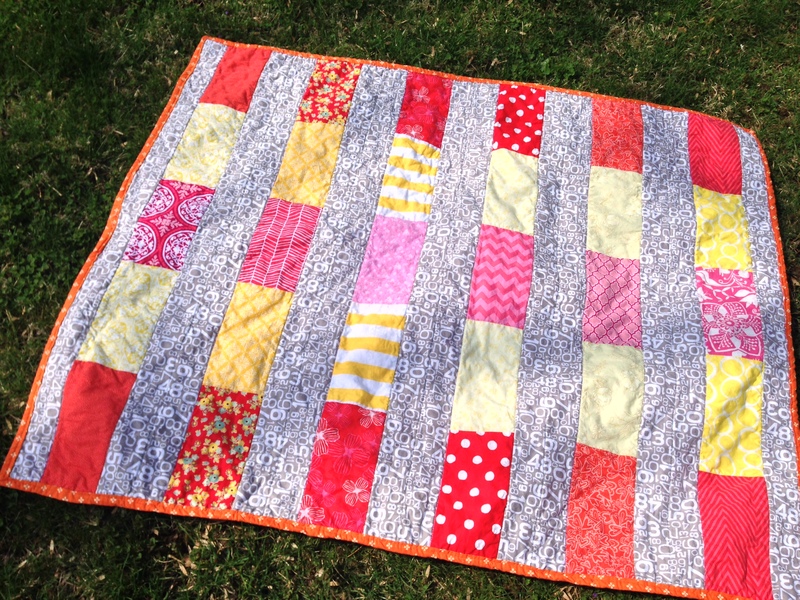 This quilt was an absolute blast…. my points are getting much crisper, and nothing much better than these warm, girlie colors on the background of my favorite fabric. It is from the DS Quilts collection and is just heartbreakingly beautiful, and went so wonderfully with the color scheme. 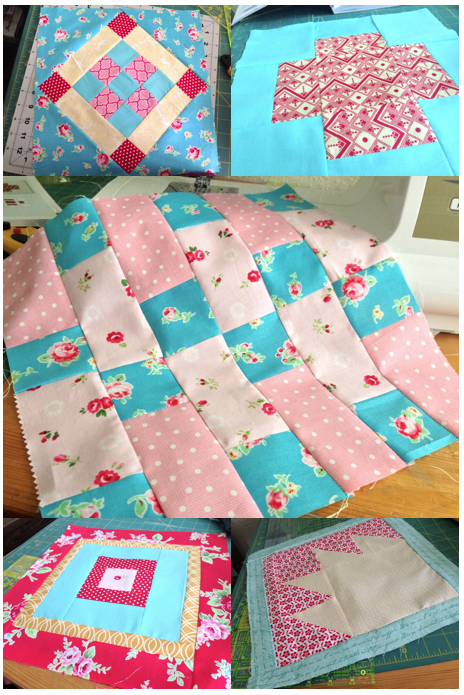 I loooooove these quilts so much. That love is tarnished a bit by the fact that I decided to machine bind them and that is HORRIBLE. Cruddy results, tear-creating process. But they will be tough for little girls… and I assume I will get better the more I do it, if I can ever face it again. Again, love this so much. The colors are so appealing to me. Especially against the greige background. 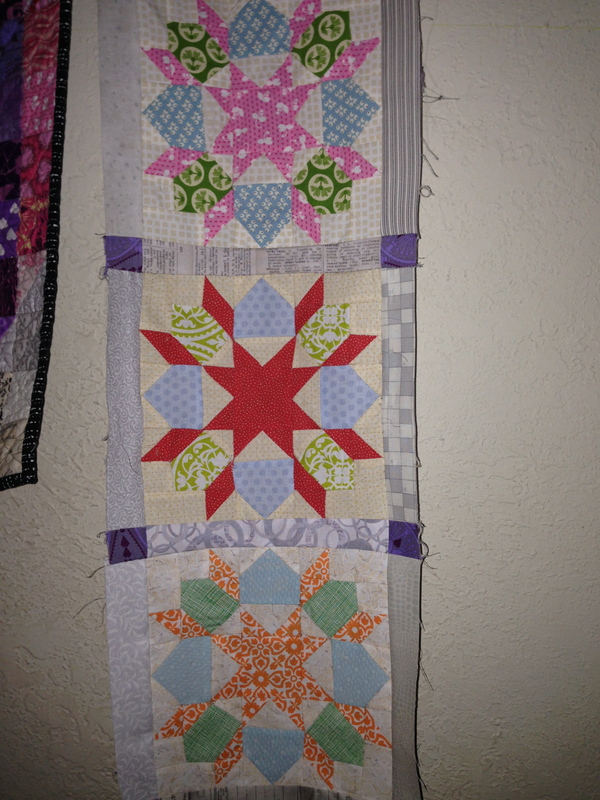 But this was a lot of work – all the HSTs in the star, the scrappy border… and so I am going to take a break from this one, and maybe come back to it and make a quilt for myself. 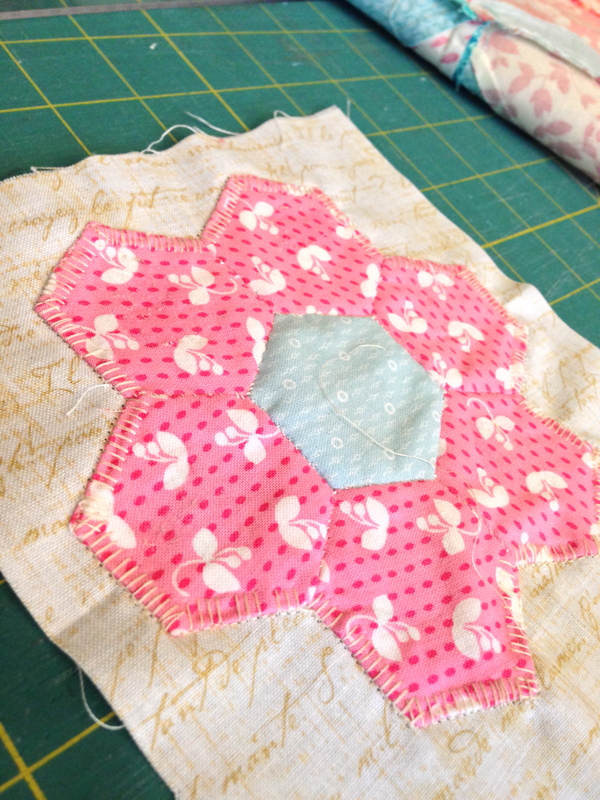 But I still have two friends for whom I wanted to make little qirl quilts. 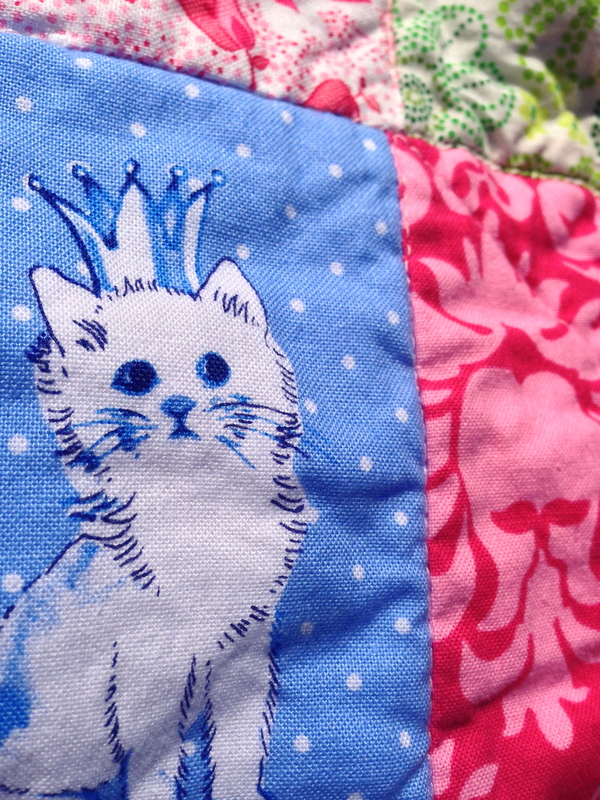 I got an on-point ruler from my parents for my birthday, and so I had fun playing with that to make this Princess Kitty Garden quilt. This was simple and fun. And the little kitty fabric is adorable. 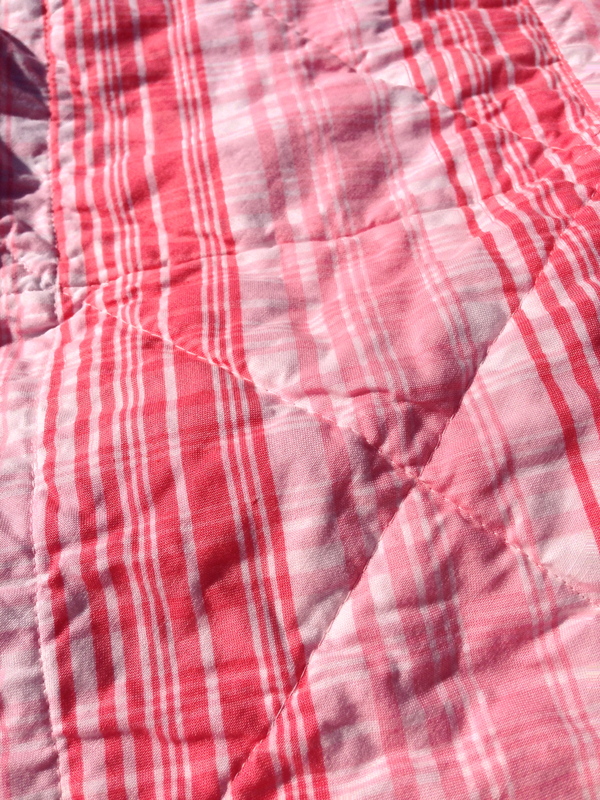 I quilted this pretty simply (as simple is all I have patience for) and backed it with this gorgeous pink plaid, that goes with the preppy style of my friend. 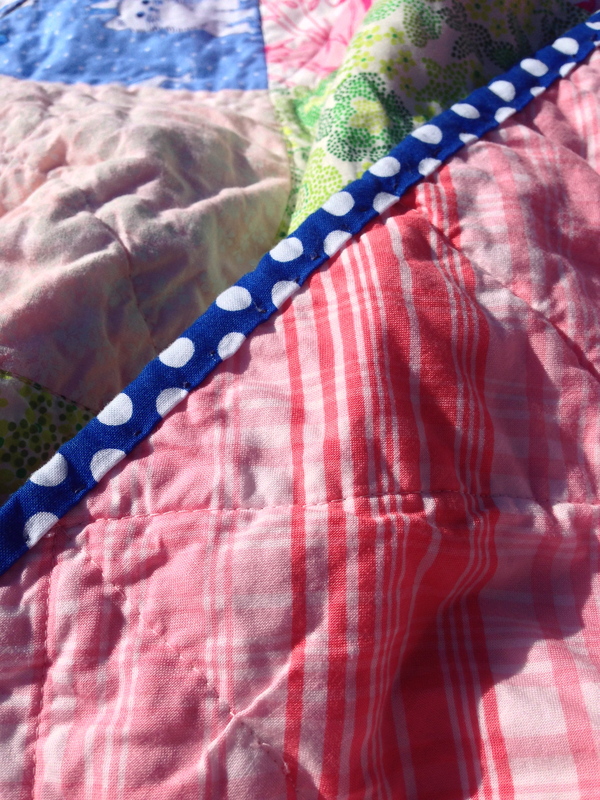 and finished it with this adorable navy polka dot. 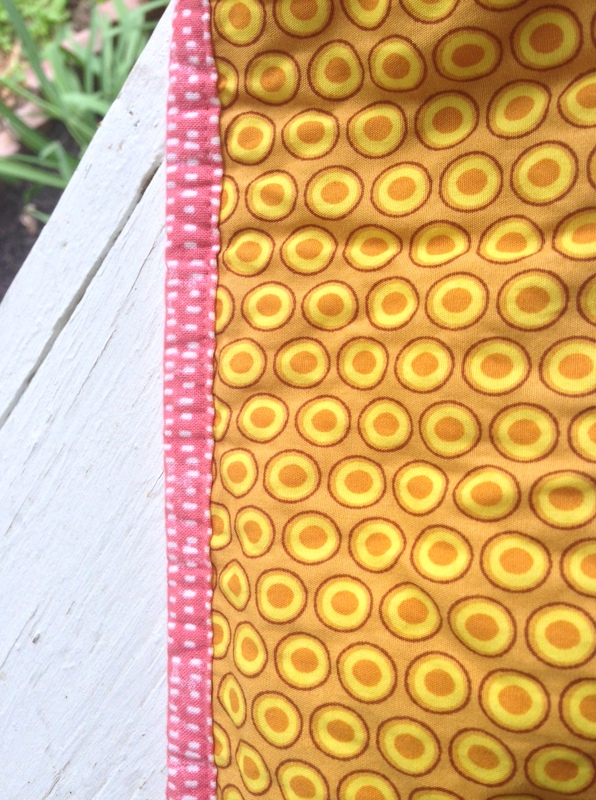 I finished the binding on this one by hand, but still hated the process – the results are much better, but it took soooo long. 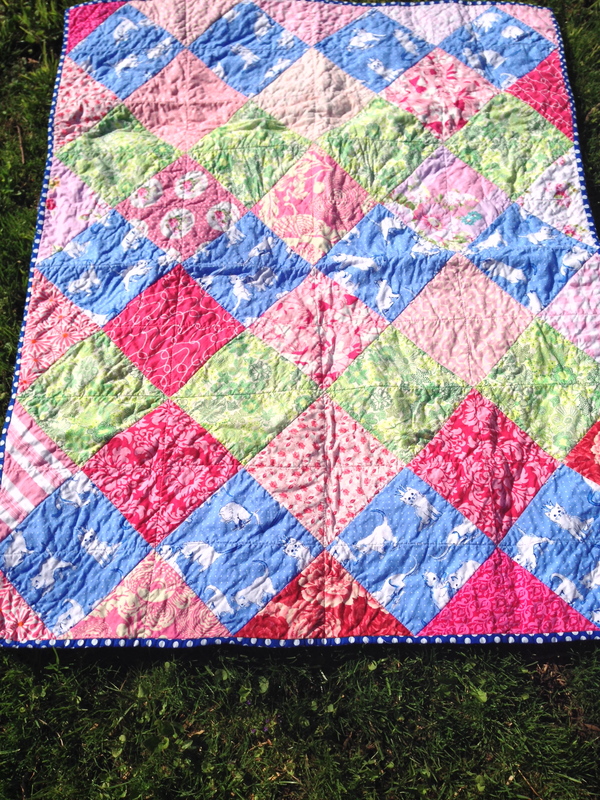 I have one more little girl quilt to finish – It is pieced, basted, quilted – but the binding remains. I thought I would get it done this weekend, but I haven’t been able to face it yet.